Hiace Hobo - Living in a Toyota Camper Van: Mitsubishi Delica Chamonix 4WD Off-Road Camper Van | Snorkel now available! 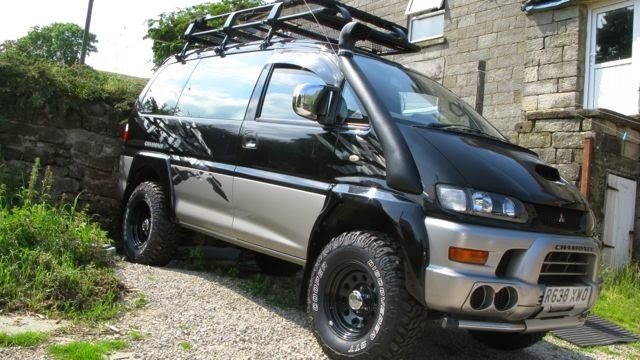 Mitsubishi Delica Chamonix 4WD Off-Road Camper Van | Snorkel now available! I'd like to share with you a very special vehicle I came across on my travels earlier this year, whilst travelling through Yorkshire.. This is a Mitsubishi Delica Chamonix model, which has been lovingly converted into a camper van of the highest standard. Take a look through the side door.. Inside there's a full kitchen with sink, two burner gas hob, and a very efficient compressor fridge. There's a removable table and really comfortable seats of course. Looking forward from the rear seat, you can see into the cockpit, and yes, thats a fold down tv from the ceiling. Looking in through the rear door of the van, you can see a great seat for parking up and having your coffee, looking out at a superb view. Its a rock'n'roll style sofa that folds out into the bed. Plenty of storage under there too, as well as in the side cabinets.. The bed's really comfortable with new foam, and sleeps two no problem. A truly awesome beast! This is a very capable off roader, and has had full suspension upgrade, with 3" lift, and is fitted with 32" Cooper STT tyres on 16" steel rims. An air intake snorkel protects the engine from dust and water, and lets it breathe cooler air. I particularly like the tubular roof rack and the overall look of this van - the black and silver paint finish and the graphics really set it off. If you'd like to purchase a Snorkel for your Delica like the one in the picture, click to go to our Webshop. Although not as roomy as a Toyota Hiace 4WD camper, the Delica is not as hard to come by. You can pick up a decent base vehicle for about £2,500, and do your own conversion as you like. I've come across a few interesting ones this year, one had a really basic conversion - all the seats removed, a wooden frame single bed, and a wood burner inside! There are also Delica's out there with pop-tops fitted which will really give you much more head space. In my opinion the only drawback to the Delica as a camper van is the size. If you're only planning on weekend trips and a few overnighters, this makes a great van that with a few tweaks will get you anywhere. If you're planning on spending longer on the road, then you might like a little more space - though in warmer climates, one set up similar to this makes an excellent expedition vehicle - just roll out the awning and set up your camp outdoors. I'd definitely consider owning one of these myself, but not as a full time live in vehicle. Here's some footage of the Delica in action..
How much would it cost to fit out the van just like this? Hi, where did you get the kitchen from please? Would love it in my van. Very comfortable n mobilize utility.